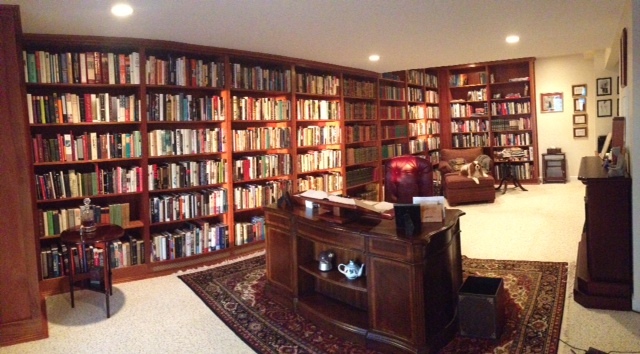 I love when people contact me with suggestions for “Library Lust” and this week blog reader Karen went one step further: she sent me a picture of her own library! “This is my library,” she wrote in her email, “the place where I read, write and study. My happy place.” Lucky Karen! I want the teapot. I love teapots. Lucky indeed. What a library! Oh wow! What a library! This is a wonderful library (and even my husband thinks so, and it’s unusual for us to agree when it comes to planning our future book-spaces!) We especially like the fireplace and the bookstand on the desk. 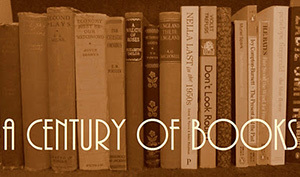 Wouldn’t I love bookshelves like these! What a beautiful room. I’d love to have those shelves – and the space to put them. Lucky Karen, indeed, as well as all of us catching a glimpse. Very nice indeed. Every library should come with a pet (and Karen’s dog is adorable). on January 26, 2013 at 17:09 | Reply Karen K.
I’m so jealous!! Someday. . . .
That is a gorgeous library. Mine is so utilitarian! So jealous; would love to have one like this.